The three wonderful courses at Gleneagles bear the hallmarks of two of golf's greatest names; five-time Open Championship winner James Braid laid out both the King's and Queen's courses, while all-time great Jack Nicklaus added the Ryder Cup host PGA Centenary Course. Playing any of the three courses at Gleneagles is a truly memorable experience, with the springy moorland turf underfoot, the green hills to the South, and the peaks of the Trossachs and Ben Vorlich to the West. The hotel is of such quality that it attracts as many guests as the phenomenal golf courses, nestled among the pure Scottish countryside, Gleneagles is just an hour north of Edinburgh. The opulent building and surrounding manicured gardens offer but a taste of the unparalleled level of comfort you will receive inside, where the hotel retains one staff member for each hotel guest. The estate also offers a range of outdoor activities such as horse riding, shooting, fly-fishing and falconry. Gleneagles has been named the European Golf Resort of the Year for 2019 by the International Association of Golf Tour Operators. The King's Course has been a frequent stop on both the PGA Tour and Ladies European Tour since its inception in 1919. James Braid was determined to create a course which placed the emphasis on the golfer's ability to shape his shots and be creative, which explains why Lee Trevino, one of the most natural players to ever play the game, said that, "If Heaven is as good as this, I sure hope they have some tee-times left." Kings' signature 18th is a brilliant finish to a fantastic round and was included in the book, Classic Golf Holes. Straight from the tee, the golfer is presented with a risk-reward shot, whereby, if they can clear the ridge and catch a down-slope, the large green is easily reachable in two. However, the risk comes in the form of two bunkers either side of the ridge, meaning that a few yards could be the difference between birdie and bogey. Once at the green, the golfer is allowed no let up and an uphill front half of the green makes for a challenging finish to a compelling round. Threading through the high ridges on the north and east side of the estate, the Queen's has many moorland characteristics, and offers beautiful woodland settings as the course meanders through the glen. With indigenous lochans and streams incorporated as water hazards, this is a beautiful and genuine Perthshire classic. The Queens Course highlight is the 12th hole. From the tee, the best position is to aim slightly right of the fairway, so that the hole is opened up when the fairway doglegs downhill and left. There is little danger on this drive too, so it is better to be longer in order to make for a shorter approach to a green. When attempting at the well protected green, it is better to aim past the pin in order to leave an uphill putt. 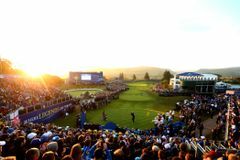 Jack Nicklaus' monster PGA Centenary hosts the 2014 Ryder Cup Matches, and while most agree that the Golden Bear has created a modern classic, Jack himself gave the credit to the canvas he was supplied with, saying that it was "the finest parcel of land in the world I have ever been given to work with." Perhaps the best performance at Gleneagles was by Adam Scott in the 2002 Diageo Scottish PGA Championships. The Australian shot a remarkable round of 23 under, beating the rest of the field by 10 shots! The gem of the PGA Centenary is the 5th, and at stroke index 1 it will certainly test every golfer. The hole requires much in the way of accuracy and throughout the long par 4, you have to make your way down a narrow fairway. The approach is dangerous too and any mis-hit shots will be swallowed up by the lake short of the hole. A nerve-racking hole with the potential to be a real scorecard wrecker! The Gleneagles Hotel is part of the Five Red Star Resort, and has recently celebrated its 80th anniversary. The quality of service on offer is unrivalled, with the hotel retaining a member of staff for each hotel guest. The grandiose building was designed to emulate the opulent style of a French chateau, while the manicured gardens were inspired by the celebrated 18th century horticulturalist Capability Brown. Whilst it is luxurious and impeccably furnished, the management maintains a relaxed attitude, in contrast to the stiff, austere atmosphere of other 5* hotels. Set amidst 850 acres of Scotland's most beautiful scenery, there are few finer destinations for a relaxing getaway. The estate offers a wealth of outdoor pursuits including horse riding, shooting, fly-fishing, falconry, mountain biking, tennis, squash and off-road driving. Indoors at 'The Club' there is state of the art fitness equipment, swimming pools, spa, Turkish baths, a sauna as well as first-class health and beauty treatments. Gleneagles offers some award winning restaurant options, eat in Chef Andrew Fairlie's restaurant, the only eatery in Scotland to be awarded a second Michelin Star. The Strathearn Restaurant provides fine dining using the finest Scottish ingredients or try the Deseo Contemporary reataurant for Mediterranean cuisine. The hotel's elegant bar stocks over 100 single malt whiskies. All fabulous loved the hotel the experience was fantastic. Many thanks for organising our golf trip to Gleneagles. The weather conditions on the day were extremely mixed, resulting in us being given a voucher to play the course on another date. The facilities within the Clubhouse (The Dormy House) are first class, however we do feel their tariff for food and beverages are a bit on the high side. Our suite in the hotel was simply fabulous, our dining experience at the Strathearn Restaurant was superb and overall we were made extremely welcome by the hotel. We would recommend Gleneagles to all age groups as a top quality sporting venue. We will go back and would have to give the overall experience a 10 out of 10 rating. YGT handled our booking very efficiently and I would definitely recommend you guys to friends. We had a great time at Gleneagles. We arrived a little early as we were playing in the afternoon but it was not a problem and our luggage was ready and waiting in our room after our round. Top class service from the off! We played the Kings course which was simply stunning, our tee times were prompt and the pace of play good. The clubhouse and shop were of very high standard too; as you would expect. Our room overlooked the gardens, and was very well appointed. We ate in the Mediterranean style restaurant which was a real spectacle of food, and breakfast was very traditional and tasty. We’d recommend Gleneagles to anyone and would recommend yourgolftravel’s service too, as it was very easy to book and all requests were satisfied efficiently. Our visit to Gleneagles was everything we hoped it would be and more – apart from the damp weather that is but this was Scotland in April and not Spain in August! The golfers still played though and absolutely loved the 2 courses. It was such a lovely touch to come off the 18th wet and have the golf clubs taken away to be cleaned, dried, stored and ready for the next day’s play. The spa was such a lovely experience too and the massage for the ladies was blissful. What can you say about Gleneagles hotel that hasn't been said before; unpretentious luxury, superb staff and service and the best breakfast you’ll find anywhere anywhere. Our only disappointment was in the mix up over our rooms in that we weren't allocated Sovereign rooms. However when this was realised during our checkout the hotel gave me a part reimbursement against my 4 room booking. Again...top class service. We have just arrived back home after a memorable time in Scotland culminating in the visit to Gleneagles. Let’s do golf first. Heather played the Kings on the first afternoon with just a caddie but there was an enormous society and the round was slow so she stopped at the 14th as we would have missed dinner. On day 2 she played the Queens with two other golfers and a very good caddie. She had a great round and thoroughly enjoyed it. My fishing was superb both at Breco and then on the Gleneagles lake dry fly fishing for brownies; a great honour for me. The ghillies were very friendly and I was even allowed to take Archie to the lake. Gleneagles hotel is an experience in itself; magnificent service in every department, two great restaurants with food that above all was flavoursome and enjoyable. The room in Braid was perfect, especially with the patio to let Archie out and then to walk him. We could go on and on about the quality of this hotel forever. So we will sign off with wonderful memories of Gleneagles made possible by your service which was of the highest quality. Having come from the 5* Star Old Course Hotel, our breath was taken away by Gleneagles from the very first moment - it truly is something else. The surroundings, accommodation, food and particularly the staff are just outstanding. As for Golf, the PGA Ryder Cup course is sensational, yet the Kings course is in equally good condition and arguably far more scenic. Thank you for arranging our golf break to Gleneagles; it really was special. I was a bit dubious before arriving at the hotel that you had actually managed to get us booked in. I had made several attempts to make a booking but was told there were no vacancies. I was recommended your website by my son-in-law and following the great service we received we will recommend it to friends and family. The booking had been made as a birthday celebration for my husband’s 60th birthday. On checking in he was immediately wished 'happy birthday'; a little personal touch which spoke volumes for their attention to detail. Not only did this happen on three separate occasions throughout our stay, but the hotel also delivered a small gift for him to our room with a hand written gift card, making our stay very special indeed. After spending a restful evening we enjoyed our breakfast which offered a large variety of choice, to be eaten while enjoying stunning views out over the grounds to the distant hills. Suitably fuelled up my husband took on the challenge of the Kings Course. From standing on the first tee he was anticipating a very enjoyable round of golf. The course was a challenge and very well maintained. The greens were faster than what he was used to with a lot of blind shots and a few words of encouragement from a green keeper, pointing out how to play the twelfth hole, was greatly appreciated. It was a beautiful day to play golf and I'm sure he would like to try the challenge of the other two courses. I know I wouldn't object to staying at the hotel again! We recently stayed at another well known 5* hotel in London but I'm afraid it was way behind the standard of Gleneagles. I would like to thank yourgolftravel.com very much for arranging our recent trip to Gleneagles for my husband’s 60th birthday. We had the most wonderful time and everything about the holiday was simply fantastic. The hotel was excellent and the staff couldn't do enough for you. Thank you also for kindly arranging an upgraded room; it was beautiful. The food was also delicious and the golf was superb. We hired bikes while we were there and the spa and leisure club were the best I have ever been to. We will definitely book through your company again....and probably go back to Gleneagles! There is one word I would use to describe the Gleneagles experience, and that word is 'sumptuous'. From the moment of arrival, and a friendly welcome from Ian, resplendent in kilt and tweed jacket at the front door, to Joe the porter who immediately took charge of our luggage, to the concierge, "can I park your car for you, sir? ", the warmth and friendliness completely enveloped us. We were lucky to be placed in a corner room, which gave a view of the rolling Perthshire hills on one side and the tennis courts on the other. Luxurious comfort awaited us in this lovely room, and the quiet and stillness of the place ensured undisturbed sleep. The 18 holes on the Queen's Course the next day proved challenging for me, a relatively novice golfer, but the splendour of the views around us more than made up for the average quality of our golf! We were even lucky enough to have a couple of deer run across in front of us at one point. The whole golf experience is extremely well organised, and the Dormy Clubhouse was alive and buzzing with Ryder Cup fever. Back at the Hotel there were many other delights waiting to be explored. The Spa is the last word in luxury and comfort, and in the evening, the food and service in the Strathearn Restaurant rounded off an incredible experience. We consider ourselves incredibly fortunate to have tasted the experience of two days with golf at Gleneagles Hotel. We are going to be working as Marshalls during the Ryder Cup, and we now know the experience which awaits the teams of golfers. Lucky boys! What a fabulous trip to Gleneagles - probably the best hotel I have ever stayed in. I isn’t cheap but definitely a very, very special 5* luxury treat. The Scottish breakfast is a magnificent meal from a bye gone era - we only needed a bar snack in the new Dormy House at the end of the round before retiring to the Spa such was the quality of the breakfast. The two long established courses – King's and Queen's – are really enjoyable with beautiful scenery, plenty of wildlife. Every hole is great fun and they aren’t overly long which adds to the appeal for the average golfer. The challenge simply comes from just clever design. Both courses make for a great warm up for the PGA Centenary Course which is a must for any golfer with a handicap of 18 or under. I for one cannot wait to revisit and overall I’d have to give the break 10/10 and would be very happy to recommend YGT for their excellent service. Our Gleneagles Golf Break was excellent. Our hotel room was stunning, overlooking the driveway to the resort, the gardens and the croquet lawn; a truly beautiful setting. We enjoyed a lovely lunch in the Dormy before I set off for 18 holes on the Kings and my partner went to the spa. When we met again later, my partner was delighted with the spa treatments and she couldn’t talk highly enough of all the staff and the condition of the spa. The golf course was in excellent condition; however the greens had been heavily sanded which made them play quite a bit slower than normal (have played the Kings a few times), and introduced the odd bobble to the greens. Highly unusual as Gleneagles greens on all courses are normally pristine. We decided to dine out at a small restaurant we know in Dunblane that evening. However, breakfast the next day was fantastic. We probably overdid it a bit! After a walk around the grounds and down to see the gun dogs, we checked out and received a complimentary box of shortbread “for the journey”. As we were leaving my partner declared that she “absolutely loved the place”. A result as this means I can disguise these golf breaks as “romantic breaks” going forward! I would like to say a huge thank you to Your Golf Travel for helping to organise our golf trip to Gleneagles. Everything was 1st class from the initial point of booking, to the hotel, golf courses, the 19th hole and even the weather! I would recommend Gleneagles and Your Golf Travel to anyone. The hotel was amazing and probably the best I’ve stayed in. Breakfast was brilliant and we had dinner in one of the restaurants at the hotel which was also very good. The members of staff at Gleneagles couldn’t do enough for us whilst we were there. Once again, many thanks to you and your team. We are just back from a truly magnificent golf trip to Gleneagles. The hotel, staff and golf courses were all amazing. The experience was one we will truly remember for a long time to come so thanks to YGT for organising a memorable 10th wedding anniversary trip. We played the Queens Course which was fantastic. Unfortunately there was lots of rain so the PGA Centenary Course was pretty wet to play. The clubhouse was beautiful with a fantastic atmosphere and decently priced fare. Hotel prices were steep but considering the 5* rating, it was worth every penny - a real trip back to how hotel service used to be. 11/10 all day long. Having come from the 5* Star Old Course Hotel our breath was taken away by Gleneagles from the first moment - it truly is something else. The surroundings, accommodation, food and particularly the staff are just outstanding - this is a 'must do' too. As for Golf, the PGA Ryder Cup course is sensational, yet the Kings course is in equally good condition and arguably far more scenic. Very simply 10 out of 10. We have just arrived back home after a memorable time in Scotland culminating in the visit to Gleneagles and we were going to contact you but you beat us to it. We had the most fabulous time at Gleneagles from the start when it poured with rain but Helen, the Guest Relations Manager, stepped in and was brilliant. Our room was ready so she took us to it and explained everything including Archie’s accommodation with blanket and two bowls! Robbie had ordered a bottle of bubbly for us that we opened there and then and toasted our children. Helen also gave us a Gleneagles present that was a surprise and much appreciated and Heather is sending her a card of thanks. Let’s do golf first. Heather played the Kings on the first afternoon with just a caddie but there was an enormous society and the round was quite slow so she stopped at the 14th as we would have missed dinner. Day 2 the Queens with two other golfers and a very good caddie. She had a great round and thoroughly enjoyed it. My fishing was superb both at Breco and then on the Gleneagles lake dry fly fishing for brownies, a great honour for me. The ghillies were very friendly and I was even allowed to take Archie to the lake. Gleneagles hotel is an experience in itself. Magnificent service in every department, two great restaurants with food that above all was flavoursome and enjoyable. The room in Braid was perfect especially with the patio to let Archie out and then to walk him. We could go on and on for ever. Finally to you. It would not have been possible or so special without your organising it. Every detail was covered and the whole visit (weather excepted) went off without a hitch. Many many thanks for your exceptional service and helpfulness and it is obvious that your rapport with Gleneagles is a major part in ensuring that we the customers have an outstanding experience. It was a very interesting experience, but one night was too short a stay; Gleneagles Hotel has evolved dramatically into a varied and self-contained, modern resort, whilst retaining an olde world charm. At one time it was primarily about the golf - then the Kings, Queens and Princes courses - but now there's so much more to see and do. To do justice to the Hotel would take, in my opinion, a minimum stay of 3 nights, just to sample what it has to offer. The golf is world class, albeit the Kings seems a lot more undulating than previously remembered. The Queens is quirky in places (in particular the 10th), but absolutely magnificent. Didn't play the PGA, but it looked tremendous and will be a fitting venue for the Ryder Cup. We had a fantastic time at Gleneagles. We even met Tom Watson and Keegan Bradley on the course (we stayed around The Open Championship) and even saw Gary Player in the hotel! Very well organised and hassle free - many thanks -for your help. Thank you for arranging our break to Gleneagles, it really was special. I was a bit dubious before arriving at the hotel that you had actually managed to get us booked in. I had made several attempts to make a booking but was told there were no vacancies. I was recommended your website by my son-in-law and following the great service we received we will recommend it to friends and family. Our stay at Gleneagles was excellent. The booking had been made as a birthday celebration for my husbands 60th birthday. On checking in he was immediately wished 'happy birthday'. A little personal touch which spoke volumes for their attention to detail. Not only did this happened on three separate occasions throughout our stay but the hotel also delivered a small gift for him to our room with a hand written gift card, making our stay very special indeed. After spending a restful evening we enjoyed a breakfast which offered a large variety of choice, to be eaten enjoying stunning views out over the grounds to the distant hills. Suitably fuelled up my husband took on the challenge of the Kings Course. From standing on the first tee he was anticipating a very enjoyable round of golf. The course was a challenge but very well maintained. The greens were faster than what he was used to with a lot if blind shots and a few words of encouragement from a green keeper, pointing out how to play the twelfth hole was greatly appreciated. It was a beautiful day to play golf and I'm sure he would like to try the challenge of the other two courses. I know I wouldn't object to staying at the hotel. We recently stayed at another well known 5* hotel in London but I'm afraid it was way behind the standard of Gleneagles. Thanks once again for helping me to arrange this special week-end. The starter on both courses very helpful and knowledgeable made us feel at ease. Halfway house excellent have never had such good bacon sandwiches!! Scenery lovely course very pretty in amongst the fir trees. The greens were very fast difficult to read and gauge the pace but as expected on a premier course.